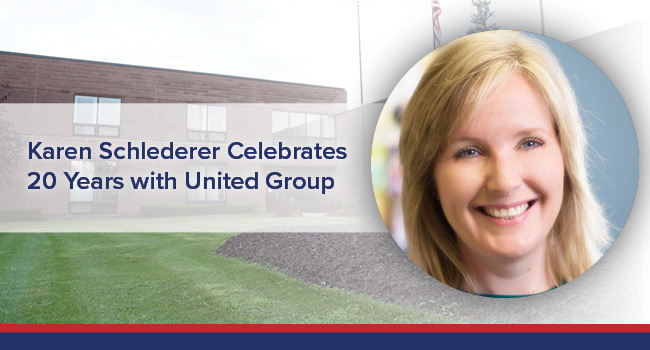 Today, United Group proudly recognizes Karen A. Schlederer’s twentieth anniversary with the company. She began her career as a leasing specialist, and currently serves as the Vice President of Development Services. Karen has worn many hats for United Group, and serves as a wealth of knowledge for every department. She’s always willing to assist colleagues and offer valuable advice to keep the company’s wheels in motion. She has played an integral role in United Group’s continued growth, and we’re very thankful for Karen’s unremitting dedication, and well-rounded skill set that helps our company thrive every single day. I was excited about starting my first day, and I remember wearing black high heeled boots which turned out to be a bad idea. We parked at the Capital Repertory Theatre parking garage, and our office was on State Street. It’s about seven very long Albany blocks and my feet hurt the rest of the day, it was so bad that I drove home in stocking feet! From that day on, I become one of those girls that you would see wearing sneakers with suits and dresses, so not attractive, but so very necessary! No, I’m not in the same role. I originally applied for the receptionist position, but Kim Williams believed that I was over qualified, and didn’t offer me the position, but was kind enough to pass my resume along to URMC. I interviewed and was hired as a leasing agent for Diamond Rock Terrace, and The Beltrone Living Center, and the rest is history! I do not have an average day at UGOC, which is one of the things I love about my job. Every morning I log into my computer, grab a cup of tea, and check my email, that’s about as average as my day gets. After checking emails, anything can happen, and it usually does. As the leasing agent for Diamond Rock Terrace and The Beltrone Living Center, every morning Walter Uccellini would ask me how many appointments I had that day, and out of those appointments, how many leases I was going to get. Let me just say, I learned quickly that those numbers better match. I love that I have an opportunity to learn something new every day. 6.) What advice do you want to give yourself now, after working for the United Group during for past 20 years? I would tell myself that I am only one person and tomorrow is another day.